Osbaldwick Primary Academy » Class 6 EM are inspired to cook! Class 6 EM are inspired to cook! University of York chefs, in collaboration with Inspiring Minds students (formerly York Cares) have been visiting Class 6EM for a Food and Culture project. 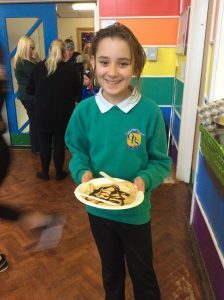 The pupils have had a go at cooking a variety of foods and yesterday welcomed parents and carers to a ‘Cafe’ where they served up some of their handiwork. New skills and good food were appreciated by all.